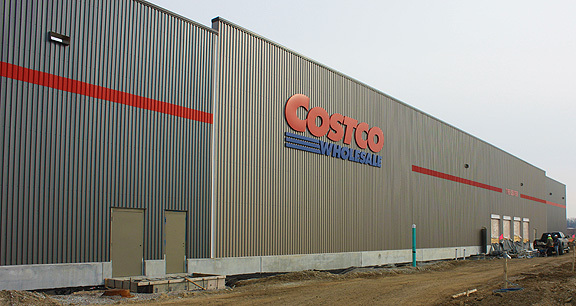 Project obstacles and solutions: Costco Wholesale Corporation announced it was building a new store, including a gas station and tire center, in Greenwood, Indiana. The 148,000 square foot building sits on 11 acres. Novak Construction was selected as the general contractor and Lithko performed all of the concrete work. This job required a fast-paced construction schedule in getting the store to a turnkey position. IMI QC/QA used a blended aggregate mix to eliminate the need for wire reinforcement in the concrete, along with a high range water reducer to lower the water-to-cement ratio to control curling. Lithko used a laser screed to move the level the concrete quickly. The specs also required special treatment of the interior floor slabs based on usage of the area of the store. The engineering specifications called for a 4,000 psi floor slab. Special considerations was given to areas where refrigerated items would be stored. This concrete was placed over an insulated floor sub-base. IMI QC/QA adjusted the mix to accommodate the cold-storage floors and the special care that is needed when finishing concrete over top of insulation. Lithko specializes in placing and finishing cold-storage concrete. IMI supplied 4,000 yards of concrete for the interior slabs and walls, plus outside paving and curbs. For more information on pouring concrete floors for cold-storage facilities, contact the sales representative for the concrete plant nearest your location. Click here.